The officials in Japan have also said that the Reactors No.s 1 and 2 are more damaged than they had thought. The pumps and other equipment for the cooling system have been corroded by the sea water they were using to cool the building and reactor. They will have to be replaced in order to do any good in the cooling of the reactor and its containment vessel. The water is still being sent across Reactor No.4 and the last things I’ve read a couple hours ago, there was still “smoke” coming from Reactor No.3. Infographic: What Is a Meltdown? a greatly simplified depiction of a Light Water Reactor core. Smoke continues to pour out of the center of the Reactor No.3 at Fukushima – as shown on CNN at 9.09 am just now before they went to commercial break – (that’s US Eastern Time) – anyway – it is pouring right out of the center of the top of the building – maybe it is just the cold . . .
Sam’s Exchange: Trading uranium | Columnists | RIA Novosti. There are 440 nuclear reactors operating in the world, with another 70 or so scheduled for completion over the next five years. The trend for nuclear power is on the increase, not just because it is one of the cleanest forms of energy production. Uranium is either mined underground, or in open pit form, and must undergo certain technological procedures in order to make it useable in nuclear power stations. Australia produces roughly one-quarter of the world’s uranium, second only to Canada. Together they produce more than half the world’s supply. Yet, fewer than 100 companies are involved in trading uranium in the western world, with pricing formulas varying widely. Nice article – interesting perspective. Especially more interesting before they dig up the whole place getting the uranium to export great quantities worldwide. Hmmm………..
Iran has up to 4 nuclear bombs By STEVE RODAN Jerusalem Post 09 April 1999 — Iranian Revolutionary Guards official quotes an engineer identified as Turkan as saying that the nuclear warheads are being stored in the Lavizan military camp in the Teheran area. IRAN HAS FOUR NUCLEAR BOMBS ICEJ NEWS SERVICE April 9, 1998 — Iran received several nuclear warheads from a former Soviet republic in the early 1990s and Russian experts maintained them. In 1992 the nuclear warheads were being stored in the Lavizan military camp in the Teheran area. Subordinate to: Islamic Revolutionary Guard Corps (IRGC) Navy Command. Primary Function: Testing, assembly, manufacture, and upgrade of Chinese-built cruise missiles such as the HY-2 Seersucker and C-801 Sardine. Reportedly, it also has built a land-based missile launch site. The city of Bandar Abbas is one of Iran’s major ports. It is located 1078km southeast of Tehran in the province of Hormozgan. Bandar Abbas hosts a missile site overseen by the Islamic Revolutionary Guard Corps (IRGC) Navy Command. The Chinese built this facility in 1987. The facility assembles and extends the range of Silkworm missiles, modifies Seersucker missiles, and manufactures rockets. The Chinese may be assisting the IRGC in extending the range to 400km. Bandar Abbas also is believed to host a launch site with three to six launchers for the land-based Silkworm. In 1996, Iran purchased 10 more Houdong fast-attack craft (FAC) from China, some of which are deployed near Bandar Abbas. These craft are equipped to fire Saccade C-802 missiles. The precise number of C-802s purchased by Iran is not known, but sources believe Iran has armed approximately 20 FAC with Saccades. In January 1996, Iran reportedly test fired a Saccade missile, causing the United States to reassess Iran’s potential threat to shipping in the region. Bandar Abbas also hosts Kilo class submarines delivered by the Russians, reportedly armed with missiles. Key Sources: Joseph S. Bermudez, Jr., “Iran’s Missile Development,” in William C. Potter and Harlan W. Jencks, eds. The International Missile Bazaar: The New Supplier’s Network (San Francisco: Westview Press, 1994), p. 66; John Pike, “Bandar Abbas,” <http://www.fas.org&gt;; Anthony Cordesman, Threats and Non-Threats from Iran (Washington, DC: Center for Strategic and International Studies, 26 January 1995); “Iranian Commentary Calls US Claims of Missile Test ‘Propaganda’,” Voice of the Islamic Republic of Iran (Tehran), 31 January 1996; in FBIS Document FTS19960131000346, 31 January 1996; Reuters, “US sees threat to Gulf shipping from Iran missiles,” Financial Times (London), 31 January 1996, p.8; via Lexis-Nexis, <http://www.lexis-nexis.com&gt;; “Second Sub for Iran,” The Washington Post, 4 August 1993, p.A12; via Lexis-Nexis, <http://www.lexis-nexis.com&gt;; Anthony H. Cordesman, Iran’s Evolving Conventional Military Forces, Working Draft (Washington, DC: Center for Strategic and International Studies, 28 February 1996); Anthony H. Cordesman, Iran and Nuclear Weapons (Washington, DC: Center for Strategic and International Studies, 7 February 2000); “Navy on Alert Since Arrival of Korean Freighter,” Sawt Al-Kuwayt Al-Duwali (London), 12 March 1992, pp.1, 11; in Proliferation Issues, 26 March 1992, pp.32-33; Melissa Healy, “Suspect Vessel Eludes US Net, Docks in Iran,” Los Angeles Times, 11 March 1992, p.A1, A9; “Rafsanjani’s Bomb,” Mednews, 8 June 1992, pp.1-5. Issue Brief: IAEA Board Welcomes EU-Iran Agreement: Is Iran Providing Assurances or Merely Providing Amusement? Issue Brief: IAEA Board Deplores Iran’s Failue to Come into Full Compliance: Is Patience with Iran Running Out? 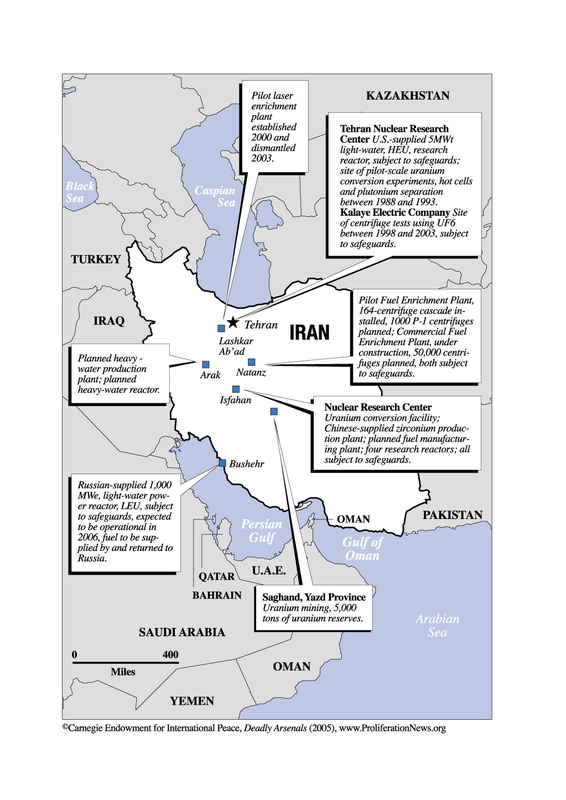 Issue Brief: Iran and the IAEA: A Troubling Past with a Hopeful Future? Since 1987 when a former Israeli nuclear technician Mordechai Vanunu told London’s newspaper Sunday Times that Israel had been producing nuclear warheads, Israel has been recognized as a de facto nuclear state. About 10 years later, in May 1998, India and Pakistan exploded nuclear devices, and declared that they became the sixth and seventh nuclear state. What country will be the next nuclear state? Iran would be one of the candidate states. Iranian nuclear weapons development is reviewed and briefly discussed here. Iran borders on the west frontier of Iraq, with which Iran competed the hegemony in the West Asia. In the east is Pakistan, which has already tested nuclear devices. In the north is Caspian Sea, the north bank of which is a nuclear state, Russia. In the south is Persian Gulf, where strong U.S. naval fleets are always present. Across the Gulf is Saudi Arabia, where several huge U.S. military bases are located. Furthermore Israel, the common enemy of Arabian countries with nuclear arsenals, is only 1,000 km apart from Iran. The Khomeini Revolution caused U.S. to sever diplomatic relations with Iran, and its international isolation still remains. Iran joins following international organizations for control of weapons of mass destruction; as a member state of Partial Test Ban Treaty (1964), NPT (1964), and Seabed Treaty (1971). It signed Outer Space Treaty (1967) (not ratified) and Safeguard Agreement with IAEA (1964). But Iran is excluded from Wassenaar Arrangement, MTCR, NSG, Zangger Committee and Organization of the Islamic Conference. Iran is a major producer of oil. At the end of 1999, 93 billion barrels of reserved oil and 25 trillion m3’s of natural gas were reportedly estimated. 5,000t of reserved uranium ore is also estimated in the dessert of the Iranian Heights. Reserved iron ore is estimated at 1.2 billion tons. Iran abounds relatively in copper, zinc and lead, but thorium, lanthanide elements, lithium and beryllium are not known of their reserved amount. Oil is produced 3.79 million barrels per year and refined 1.52 million barrels per year. Oil field survey, oil well drilling and oil-refinery plant building were used to be conducted with economic and technical assistance from foreign countries, but Iran recently conducts them by itself. Natural gas is produced 90 billion m3 per year. Petro-chemical products are produced per year as follows: chlorine 240,000t; Ammonia 1,422,000t; urea 1,758,000t; nitric acid 386,000t; sulfuric acid 960,000t; ammonium nitrate 254,000t; sodium hydroxide 33,000t; and phosphoric acid 240,000t. Iran has more production capabilities than developing countries in the area of electric and electronic industries. Major R & D laboratories for a nuclear development are the Teheran Nuclear Research Center (TNRC) and the Esfahan Nuclear Technology Center (ENTC). TNRC is officially assumed as a research facility, but reportedly it also produces nuclear-weapon related materials. TNRC has a 5MWe research reactor, which was provided by U.S., and the reactor is officially reputed to be used for production of radioactive isotopes. The reactor changed its fuel rods to 20% enriched uranium rods made in Argentine. TNRC reportedly has a plutonium extraction plant, but there are some articles, that denied it. TNRC also has a uranium conversion facility, where crude uranium refined at the Sagham Mines Complex or at the Yadz University Nuclear Research Department, is converted into yellow cake. There are sufficient evidences to certify the presence of the facility, but the facility reportedly have not operated for a while. If yellow cake was produced here, it would be sent to the Fasa/Rudan Research Center in order to convert into uranium hexafluoride, and then would be sent to the Mo’allem Kalayeh facility in order to manufacture enriched uranium fuel rods for a reactor. At the Ibn-e Heysam Laser Technology Center, the subsidiary organization of TNRC, uranium Laser enrichment and the inertia-confinement fusion are studied. ENTC was established by the Ayatollah Khomeini Regime in 1984, just in the midst of Iran-Iraq war with a strong intension of nuclear development. ENTC is officially assumed as a research center, but it is regarded as the de facto center of the nuclear-weapon development. ENTC has a 27 kW miniature neutron source reactor, two sub-critical reactors, and four research reactors, employing about 3,000 workers. Furthermore, there has been a rumor afloat that ENTC has a 27MW plutonium production reactor, but the rumor may be some confusion as to a 27 kW miniature neutron source reactor. ENTC also has a China-made Calutron, but it is said to have no enrichment capability because of its non-corrosion resistance. But it is evident that it produces isotopes for medical treatment at least. There has also been a rumor of a conversion facility here, where uranium was converted into uranium hexafluoride, but some evidences suggested that the conversion facility was located at the Fasa/Rudan Research Center. ENTC also has a zirconium manufacturing facility, where zirconium cladding tubes for reactor fuels are manufactured. Other nuclear R&D laboratories are the Laser Research Center, the Theoretical Physics & Mathematics Research Center, the Bushehr Nuclear Power Complex, the Gorgan Al Kabir Nuclear Center, the Tabriz Laboratory, and the Bonaz Atomic Energy Research Center. At the Laser Research Center an atomic Laser enrichment is presumably studied. At the Theoretical Physics & Mathematics Research Center high energy physics, elementary particle physics, theoretical nuclear physics, and statistical mechanics are presumably studied. Since 1967 when Iran introduced a 5MWe research reactor from U.S., Iran has been making steady efforts to construct nuclear power plants for civil use. The Atomic Energy Organization of Iran was established 1975, and then a nuclear power plant construction was started at Bushehr with the aid of a West German company, Siemens, and a French company. But the Islamic Revolution stopped the construction in 1979, and the plant was severely damaged during the Iran-Iraq war. After the war Iran tried to tap Germany for reconstruction of the plant, but in June 1991 Germany refused it because of possible military use. In January 1995 Russia made a contract of constructing two Russian light water reactors at Bushehr, where the broken plant was constructed. One of them is supposed to start operations in December 2003. Iran reportedly introduced several small research reactors from China. All these were for peaceful use, but the steady introduction of nuclear reactors and introduction of construction/operation technology have caused a suspicion of nuclear-weapons ambition to Western countries, especially U.S.
Iran has five confirmed research reactors, one power reactor under construction, one power reactor planned, and three unconfirmed reactors. All of them were imported and constructed. Table 1 shows Iranian nuclear reactors in operation, under construction, and under contemplation. Iran may have four motivations of nuclear development: ①to have a deterrent to Iraqi conventional forces and weapons of mass destruction, ②to have a measure of lessening American influences to the West Asia, ③to have a countermeasure against Israeli conventional forces and nuclear forces, and ④to have a symbol of an Asian great power. Iraq is the sworn foe, to which Iran fought several times for hegemony in the West Asia. Both countries launched chemical weapons each other during the Iran-Iraq War, which lasted from September 1980 to July 1988. UNSCOM found out not only chemical programs, but also nuclear and biological programs through its inspection to Iraq after the Gulf War. These facts are supposed to lead Iran into development of surpassing weapons including nuclear weapons as a natural consequence. The U.S. attacked Afghanistan in retaliation for the multiple terrorism on September 11th 2001, and by chance the U.S. could establish military bases in Pakistan, Tajikistan and Turkmenistan. The military presence in the area considerably strengthened U.S. influences on the West Asia. The region leads the world in oil production. A powerful U.S. influence over the region is a major issue for Iran, because petroleum is the primary industry of Iran. The U.S. has implemented economic sanctions against Iran since 1979. Iran must find some ways of dealing with the sanctions. A nuclear weapon is an extremely valuable measure of lessening U.S. influences over the West Asia. Israel has the strongest conventional forces in the Middle East and it was recognized as a de facto nuclear state, even though the country itself made it ambiguous. The conventional forces and the nuclear weapons seem to back recent Sharon’s bullish behavior against Palestinians ignoring world’s public opinions. It is a common Arabian objective to have nuclear weapons as a countermeasure against Israeli nuclear weapons. Iran naturally hopes to develop nuclear weapons, even if the country is not a member state of the Organization of the Islamic Conference. A nuclear weapon is a status symbol of a big power. Iran is isolated from international community in one way or another. Hence it is natural to attmpt nuclear weapons development as a breaking –through measure of the situation. Iranian acquisition processes of a nuclear weapon are supposed as follows: ①illegal acquisition of nuclear weapons from the former Soviet Union countries, ②indigenous development of nuclear weapons through secret purchase of nuclear materials, ③indigenous development of nuclear weapons supported by Russia and/or China, and ④indigenous development by Iran own. In 1992 Russia was designated as the successor to the Soviet Union, which was authorized to have nuclear weapons by NTP. On the other hand Belarus, Kazakhstan, and Ukraine, where nuclear weapons had been deployed, became non-nuclear states. Thus all nuclear weapons out of Russia should have been transferred to Russia and put under the Russian control. But confusion in Russia lasted long time and it made Russian managing ability questionable. Rumors were in the air that some nuclear weapons of former Soviet Union were missing and a part of them passed into Iran, Iraq, and Pakistan. The de facto nuclear states such as India, Pakistan, and Israel were said to have developed nuclear weapons using so called “reverse engineering”, which was indigenous engineering simulating purchased materials and equipment. The former Soviet countries are eliminating or cutting down nuclear weapons, thus nuclear materials, equipment, and technicians are in excess. These materials and technicians are said to have turned to the black market. There are many reports on newspapers that such black-market materials are confiscated by the customs in European countries. Therefore, such materials possibly flow into Iran. Russia and China collaborate on nuclear development for peaceful use with Iran making a nuclear agreement respectively. 1992 Iranian nuclear technicians visited a nuclear-weapon related factory in Kazakhstan. In January 1995 the Russia-Iran nuclear reactor agreement was signed. In January 1999 the Moscow Aerospace Laboratory and two other Russian laboratories were accused of providing Iran nuclear technologies and were boycotted in business by the U.S. government. China used to be the main provider of nuclear technologies since 1985, and made an agreement to provide Iran with two reactors 1992. But China cancelled it 1995 yielding to the U.S. pressure. However, these kinds of collaboration will possibly occur in the future. The Iranian government has repeatedly denied her intention of developing nuclear weapons. But a U.S. agency confirmed that Iranian technicians visited the Ulba Metallurgical Plant at Ust-Kamenogorsk in Kazakhstan in 1992, where a fast breeder reactor was operating and fuel rods were manufactured and spent fuels were reprocessed. The “Nuclear Fuel” (Dec. 5th, 1995) reported that the U.S. bought 650kg of HEU from Kazakhstan in 1995 to prevent Iran from obtaining the HEU. The ”Nucleonics Week” (Sep. 22nd, 1996) also reported that Russia promised Iran to sell 2,000t of natural uranium in accordance with 1995 Russia-Iran nuclear agreement. Therefore, Iran seems to have had no capability of extraction and refinement of uranium at the point of 1996. Washington Times (Apr. 17th, 1996) reported that Iran had been constructing a conversion facility at Esfahan with a Chinese assistance since about 1990, where yellow cake was converted into UF6. Chinese assistances were stopped in March 1997 yielding to the strong U.S. pressure. But possibly Iran had already obtained necessary materials and basic technologies of yellow cake conversion. Iran had reportedly tried purchasing materials necessary for conversion several times. The “Nuclear Fuel” (Apr. 10th, 1995) reported that some Iranian subsidiary company sometimes had tried to buy samarium-cobalt magnetic rings for a balancing machine and/or a bearing of a centrifugal separator of a laboratory scale from German and Swiss companies since 1990. The magazine (May 8th, 1995) also reported that Russia agreed to provide Iran with centrifugal separators in March or April 1995. But Reuter (Feb. 23rd, 1996) reported that President Yeltsin and President Clinton met May 10th, 1995, and agreed that Russia would cancel the agreement with Iran and remove the centrifugal separators. Thus, Jane’s estimated that Iran has crude centrifugal technologies, but Iran has little capability to manufacture essential parts of a centrifugal separator such as a UF6-resistant rotor, header, and scraper, because Iran imported these items. The major research in Iran may be located in some laboratory in the Ghazvin military base. Little information is available as to Iranian Laser enrichment technologies. Russia agreed to provide the Laser Research Center of the Iranian Atomic Organization with the atomic Laser enrichment method; thus Iran may mainly study the atomic Laser enrichment method. But import of Laser equipment and uranium metal vapor generators are essentially required to complete the method. The atomic Laser enrichment technology may be studied at the Ibn-e Heysam Laser Technology Center and the Laser Research center. There is unconfirmed information that Iran also studies electro-magnetic enrichment at the Karaj Agricultural & Medical Research Center, using a China-supplied Calutron and a Belgian Ion Beam Application Cyclotron. Britain disclosed that its customs found a small amount of maraging steel usable for centrifugal separators shipping for Iran, and then stopped the cargo from departing. That made the suspicion of Iranian nuclear development rise to the surface. The CIA director John M. Deutch testified at the congress hearing that “Iran made active efforts to obtain indigenous capabilities of developing nuclear weapons, and the focus was on the production of plutonium and HEU. In order to shorten the development term, Iran also tried to import nuclear materials from former Soviet countries as well.” An American high official told on December 19th, 1997 that China had intension to stop selling a UF6 production plant. His words brought to light the Iranian intention of uranium enrichment. An Israeli newspaper reported in April 1998 that Israel had received an Iranian document that indicated Iranian obtainment of several nuclear warheads from a former Soviet country. The paper also reported that Iran had received four nuclear warheads from Kazakhstan, and the warheads had been maintained by Russian nuclear specialists. But just after the report, the DOD spokesman denied them, saying that there was no evidence. A British newspaper reported on April 24th, 1998 that Iranians were arrested on the charge of purchasing nuclear-weapon related materials and technologies in Britain. What the nuclear-weapon related materials and technologies meant is not clear. On January 12th, 1999 the Presidential Aide Burgher made a speech that three Russian laboratories were accused of collaborating with Iran on development of ballistic missiles and nuclear weapons and they were imposed sanctions of banning trade and assistance. They were the “Electric, Science, Technology and Design Laboratory”, the “Mebdeleev Chemical Technology University”, and the “Moscow Aerospace Laboratory”. In March 2000 Czech government announced that Czech would not permit a manufacturer the export of ventilators in production for an Iranian nuclear reactor. This means that Czech entertains apprehensions upon Iranian extraction of plutonium from spent fuels. In June 2001 the Washington Post reported that a Russian metallurgical company had exported high-tensile aluminum alloy to Iran that could be usable for a rotor of a centrifugal separator of uranium enrichment. Thus, Iran still needs foreign assistance to enrich uranium. With respect to atomic affairs, Russia and Iran increasingly work in closer cooperation. In April 2000 Ministry of Russian Atomic Energy, Adamov, asserted at the executive council held in Snezhinsk (former Chelyabinsk) that Russia had intention to export Iran three more reactors. President Putin, who served as the chairman of the meeting, acknowledged the Minister’s words. Recently Iranian dependence upon Russia seems to be increasing. But on March 7th, 2000 the Czech Lower House passed the expert ban of military critical items, thus Czech manufacturer ZVVS could not provide Iran with equipment for the Bushehr nuclear plant. And so, Iranian nuclear development has not being progressing on schedule. Regarding these factors, Iran seems not to possess, not only capability of constructing a nuclear reactor as a whole, but also manufacturing a turbo alternator and other equipment for a nuclear plant. Taking these facts above into account, the followings could be said. ① Iran explicitly has the intention of nuclear armament. ② Iranian nuclear programs are progressing step by step since the end of Iran-Iraq war in July 1988. ③ Iran has not attained self-sufficiency in its nuclear fuel cycle at the end of July 2002. ④ Iran has to import most of the materials and the technologies for a nuclear weapon from foreign countries such as Russia and China. From other information sources, the followings are estimated. ① Iranian development & production programs of nuclear weapons are integrated into civilian nuclear development & production, which is conducted under the direction of the Nuclear Power Organization. ② Iranian nuclear programs seem to be mainly conducted by the Nuclear Power Organization under the strong influence of the Revolution Guard Corps (Pasdaran), and agencies of Pasdaran cooperate with subordinates of the Nuclear Power Organization. ③ Most of Iranian nuclear-weapon related companies are national enterprises under the Islamic Foundation. As mentioned above, there are four ways for Iran to acquire nuclear weapons: ①illegal acquisition of nuclear weapons from former Soviet Union countries, ②indigenous development of nuclear weapons through secret purchase of nuclear materials, ③indigenous development of nuclear weapons supported by Russia and/or China, and ④indigenous development by Iran own. Iran will be a nuclear state, when Iran illegally acquires a nuclear weapon, whether Iran can use it properly or not. But at the end of July 2002 Russia has been more stable than in 1990’s. Furthermore the U.S. gives economic and technical assistance to ensure the control of Russian nuclear weapons in accordance with the Nunn-Lugar Act (Public Law 102-228). Therefore the possibility of illegal acquisition of nuclear weapon is quite low. If Iran secretly obtains nuclear-related materials, it will take 1-3 years to complete manufacturing a nuclear weapon, depending upon kinds and quantity of the materials acquired. But after the Gulf War, the Nuclear Supply Group reviewed the London Guidelines and Warsaw Guidelines in detail, hence, the possibility for Iran to acquire nuclear materials becomes lower. If Iran develops a nuclear weapon secretly with assistance from foreign countries such as Russia and China, it will take 5-10 years to have an atomic bomb. China seems to retreat its assistance to Iran, but Russia appears to assist Iran aggressively in the area of peaceful nuclear development. Hereafter the relationship between India and Iran in the area of an atomic power should be focused on carefully. When Iran develops a nuclear weapon by its indigenous technologies, it will take 10 years or more. But since this will be the worst case for Iranian to be a nuclear state, Iran will try to avoid it as much as possible. Here I conclude that Iran will join a nuclear club within 5-10 years, if the present situation continues. Recognizing Iranian natural resources and industries, it is very hard to prevent Iran from becoming a nuclear state, even if the development of a nuclear weapon could be retarded by export control and/or a public opinion of the world. The only way of prevention is to make an environment, where Iran realizes that its nuclear armament is not the best policy. However by early March 2004, Iran faced criticism for failing to disclose parts of its nuclear programme in a resolution drafted at a meeting of the UN nuclear watchdog. According to the IAEA’s report Tehran failed to reveal sensitive research in a declaration submitted last October. The report singled out Iran’s failure to declare that it was researching advanced centrifuge designs, known as P2, capable of producing highly enriched uranium. In early March, Iran first banned IAEA inspectors after the agency issued a resolution accusing Tehran of secret nuclear activities but later claimed the cancellation of the inspectors visit was due to “technical problems” and agreed to their to return. All this at a time when the United States is keen to accuse Iran of developing a secret weapons programme and wants the IAEA to declare the country in breach of the Nuclear Non-Proliferation Treaty (NPT). There is little doubt amongst the scientific community that Iran’s uranium enriching programme and centrifuges buried underground belie the regime’s claims that its nuclear programme is “entirely for peaceful purposes”. When IAEA inspectors first found enriched Uranium in Iran’s nuclear deposits, the government claimed that this was an accident caused by contamination, and even blamed imported equipment for this contamination. However the quantity and quality of enriched uranium found in Iran contradicted these claims. Of course enriched uranium can be used for commercial reactors (as can plutonium). But NPT countries are not supposed to enrich uranium without mandatory IAEA inspections because of its potential for “dual use”. To make a bomb that will be carried in a missile you need 25kg of highly enriched uranium or 8kg of plutonium. Natural uranium contains less than 0.1% of fissile material. This fraction needs to be increased to 20%-90% to make a weapon. This “enrichment” is what the centrifuges do. The other route to a nuclear weapon is to create fissile uranium or plutonium in a reactor and use chemical processing to extract it – this is what is done at Sellafield, UK. A number of counties, including France, reuse enriched uranium and plutonium from reprocessed fuel in reactors. The idea is that they are then independent of sources of natural uranium as the “breeder” reactors create more fissile uranium and plutonium than they consume. Iran enriches Uranium above 20 %. This is precisely what can be used for nuclear weapons. <!– (view record) –> This site provides images of “the complete collection of maps from Carnegie’s, ‘Deadly Arsenals: Nuclear, Biological, and Chemical Threats’. … The first five maps reflect the worldwide proliferation of nuclear, chemical, and biological weapons and their missile delivery systems. 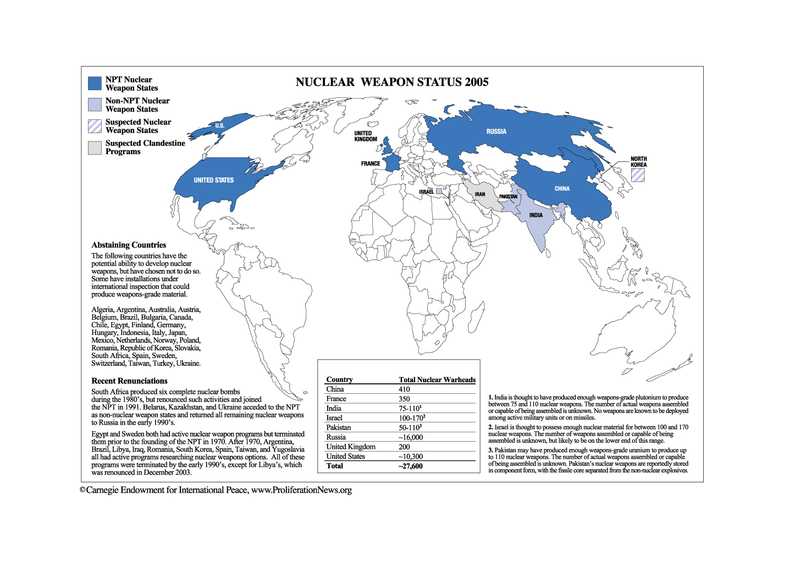 The country maps show the major nuclear installations, both civilian and military, in each country.” Includes maps of Iran, North Korea, China, Russia, Pakistan, Libya, Israel, and other countries. From the Carnegie Endowment for International Peace. This report describes an experiment that took place at a time when policymakers wanted to know how difficult it would be for a non-nuclear power to develop a nuclear weapons capability. Lawrence Livermore Laboratory paid two newly-minted physicists, with no access to or knowledge of classified information, to “produce a credible nuclear weapons design.” After three “man-years”, the two physicists had a design for an implosion nuclear weapon. The report’s conclusions remain classified, but apparently the experiment was a success: it showed that any capable physicist could design a nuclear weapon.